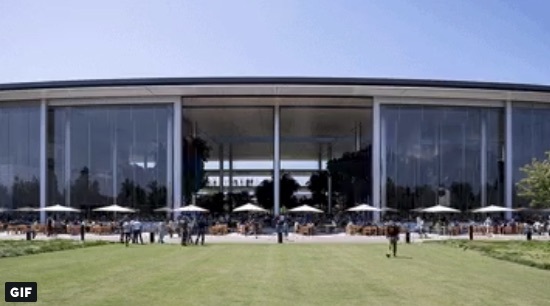 Apple CEO Tim Cook on Wednesday shared an animated look at how the 3-story doors to the Spaceship Campus lunch room open. Cook’s tweet includes a GIF that demonstrates the very cool, ginormous sliding doors that slide open. The tweet reads “Lunchtime at Apple Park just got a whole lot more exciting”. The sight of the 3-story tall curved glass doors opening up is an awesome sight, and looks like it should be experienced in person at the new Apple HQ. It’s still impressive, even in a small GIF animation.